The Veritas Power Tenon Cutters make round tenon cutting for rustic furniture quick, accurate and easy. Each has been balanced to minimize vibration while being driven with an electric drill, and an integral level vial helps you keep the tenon cutter level. The blade is adjustable to cut the exact size of tenon required. It is easy to sharpen the blade with the integral sharpening jig that holds the blade at the optimum angle. Veritas Tenon Cutters are for use in a hand electric drill. They are not to be used in a drill press for several reasons. Firmly tighten the tenon cutter in the chuck of an electric drill. For the large-size tenon cutters (1-1/4 inch to 2 inch dia.) a minimum 1/2 inch (13 mm) chuck is required, and a high-torque, low-speed (~500rpm) drill is recommended. Clamp a piece of wood horizontally in a vise at about waist height. Use a piece no larger than the diameter specified in Table 1 for the tenon cutter to be used. Ensure the end is cut square. Putting a substantial chamfer on the end of a piece of wood that is at or close to the upper limit of the tenon cutter's capacity will make starting the cut much easier. Maximum Wood Diameter for Tenon Cutter Diameter. Place the tenon cutter on the end of the piece of wood and rotate the tenon cutter by hand until the level vial is at the top. Raise or lower the drill until the bubble is centered in the vial. Adjust the drill left or right by eye so that it is in line with the piece of wood. It is important to realize that the tenon cutter will cut tenons in line with the axis of the drill. If you wish to have a tenon come off the end of the piece of wood at an angle, clamp the piece in a vise at the desired angle (using an inclinometer if necessary). Cut the tenon while holding the tenon cutter straight and level, using the level vial as an indicator. While leaning into the wood, switch on the drill at a moderate speed (500 to 700 rpm for 5/8 inch to 1 inch dia. tenons, 100 to 200 rpm for 1-1/4 inch to 2 inch dia. tenons). Turning too fast may cause you to wander from a straight cut. If the blade is properly set, a long continuous shaving of wood will curl out of the tenon cutter as it rotates. If the tenon cutter stops cutting or does not cut at all, you will need to adjust the blade. There are two adjustments that can be made to the tenon cutter. The one you will use most often is the blade advance to obtain the desired tenon diameter. The second adjustment allows you to reduce the thickness of cut. 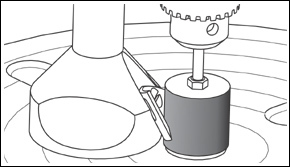 To adjust the blade, back off the clamping screw about one half turn if you intend to advance the blade, or fully relieve the pressure if you need to retract the blade (see Figure 1). Advance or retard the blade advance screw by about one half turn, retighten and test. Repeat until you can cut a continuous shaving of wood. Then test the tenon for size. To fine tune it, remember that advancing the blade will reduce tenon diameter and vice versa. Note: Never adjust the blade without first loosening the blade clamping screw as you may damage your tenon cutter. Figure 2: Shimming Blade to Increase the Tenon Size. In some instances, you may find that backing the blade off to its minimum projection into the main bore will still not yield a tenon sufficiently large for a snug fit into your mating hole. By cutting a 1/8" wide strip of the included 0.010 inch thick shim and placing it between the blade and the body (just behind the blade clamping screw), the maximum tenon size will be increased by approximately 0.020 inch (see Figure 2). 0.010" Shim 1/8" wide 0.25 mm thick and 3 mm wide. Note: Only one shim may be added in this location; adding more will elevate the blade beyond the point at which the blade can still cut the tenon. Figure 3: Shimming the Blade to Reduce Shaving Thickness. 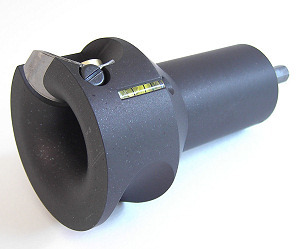 The tenon cutter is designed to cut a 0.030 inch thick shaving at the largest portion of the tenon shoulder, decreasing in thickness as it reaches the main bore. Depending on the size of shoulder and dryness of the wood being cut, you may want to reduce this. For example, cutting a 1 inch tenon on a 2-1/8 inch stick will produce a large shoulder, so a correspondingly large surface area of wood must be cut away. 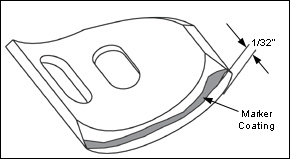 By cutting the 0.010 inch thick shim into 1/8 inch to 1/4 inch wide strips and placing one or more between the blade and the body near the mouth, the shaving thickness will be reduced (see Figure 3). While it will take longer to produce a tenon with a smaller shaving, less torque is required to turn the cutter and control is improved. A tenon cut to full depth will be 2-3/4 inch long with the 5/8 inch to 1 inch dia. tenon cutters, and 4-1/4 inch long with the 1-1/4 inch to 2 inch dia. tenon cutters. (Note: tenon lengths do not include the 3/4 inch long shoulder). Tenon length can be reduced by making a depth stop using the rare-earth magnet that comes attached to the back end of the hex drive. With the blade advanced to cut the minimum tenon size, cut a full-length tenon. Cut off the end of this tenon to obtain a dowel of the required length; dowel length = (tenon length without depth stop) - desired tenon length (see Figure 4). Counterbore a hole in the center of one end, only deep enough to house the magnet. Bond the magnet into the hole using epoxy adhesive. The body of the tenon cutter has a side flute for use as a sharpening jig. Move the blade from the cutting position to the sharpening position (as shown) and fix it in position with the blade clamping screw placed in the central slot in the blade. Note: The 1-1/4 inch to 2 inch dia. tenon cutters contain a 3/8 inch long screw in the side flute. This may be used to fix the blade in position for sharpening. Its primary purpose, however, is to allow a blade that has been shortened from repeated sharpenings to be sufficiently advanced. This will become evident when the 1/2 inch long blade advance screw bottoms out in its counterbored hole before the blade is sufficiently advanced. This is the time to switch the two screws. You can now sharpen the blade on a 1-1/2 inch sanding drum mounted in a drill press. We recommend a silicon carbide sleeve (80x if you have a nick to remove followed by 120x for regular honing). Set the drill-press spindle speed between 1000 and 2400 rpm. Coat the entire bevel of the blade with an indelible marker. Using the tenon cutter body as the sharpening jig (see Figure 6), firmly but gently slide the tenon cutter body and blade into the drum. Do not hold the blade in contact with the drum for extended periods of time (more than a few seconds) or you may overheat the blade. 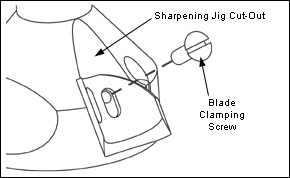 Figure 5: Blade Mounting for Sharpening. Observe where the marker coating has worn off. Continue sharpening until the entire blade edge is clear of marker coating (at least 1/32 inch wide) and all nicks have been removed (see Figure 7). Vary the height of the drill-press table from time to time as you sharpen to distribute the wear on the sleeve. Remove the blade from the sharpening jig cut-out. 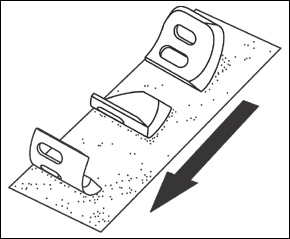 To remove the wire burr from the edge of the blade, simultaneously swipe and roll the outside radius of the blade across a fine grit (1000x or higher) sharpening stone or piece of silicon carbide abrasive paper on a flat surface (see Figure 8). Because the blade has been sharpened and is now slightly shorter, it will require an adjustment. Re-install the blade and adjust it as previously described until you are able to cut continuous shavings and the tenon is the correct size. Uneven Tenons: This is usually caused by an unsteady drill position while cutting. Reduce your drill speed and concentrate on holding the drill steady while cutting. Undersized Tenons: These usually indicate a blade that has been advanced too far. Back off the blade and try another cut. The other cause, when the tenon wanders off-center during the initial shoulder cut, can be controlled to a degree. Smaller pieces have less tendency to exhibit this because the initial square-cut ends contact the bell-mouth at a fairly steep angle. Wood pieces that are near the upper limit of the tenon cutter's capacity contact the bell-mouth where that contact angle is much shallower, thus not as easily guided into the main bore. Press the drill hard into the wood piece, only until the tenon shoulder is formed. At that point, reduce the inward pressure; otherwise, a scalloped tenon may result. Putting a substantial chamfer on the end of a piece of wood that is at or close to the upper limit of the tenon cutter's capacity will make starting the cut much easier. Partial Tenons: If the tenon cutter starts cutting, then fades and eventually stops cutting, this indicates that a minor blade adjustment is required. Advance the blade a half turn or less and retest. If the blade adjustment does not solve the problem, another cause might be an off-center tenon. With large pieces of wood, the tenon may wander off-center, producing uneven shoulders and causing the tenon cutter to stop cutting. Remove some of the excess material to even out the shoulders, then continue to cut the tenon. Uneven Grind When Resharpening: This usually happens when the drill-press table on which the tenon cutter is resting is not square to the quill. Adjust the table using a straight pin chucked in the drill press and a square on the table. The other cause may be due to slight variation in diameter between individual sanding sleeves. The bevel on your blade may change slightly as a result, but this will not affect the performance of the tenon cutter.